A house is not complete without furniture. I haven’t seen a home without single furniture. It is one of the important things that homeowners need to consider. Furniture brings function to a room, whether it is for the bedroom, dining room or living room. 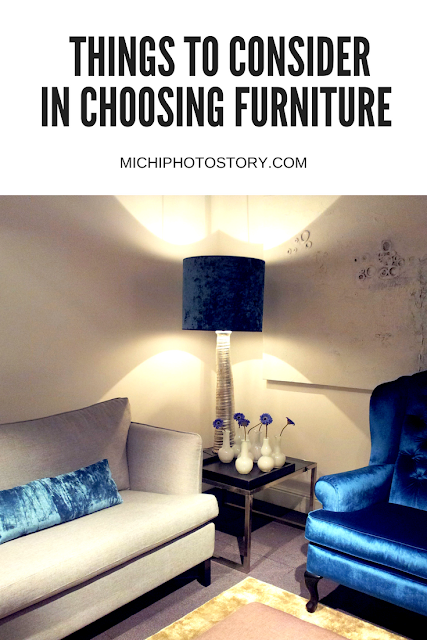 I know that choosing furniture is not easy but here are the things that you need to consider in choosing the right pieces. The most important factor that you need to consider is space and size. Do you have a big house or a small house? If you only have a limited space, you need to choose furniture that will fit your room. It is a must to note all the measurements before buying one. Next thing to consider is materials, what type of material you want to purchase? Do you want plastic, glass, wood or metal? If you want wood, there are many types of wood so you need to know your wants and likes. Styles and color is another important thing that you must consider. It depends on your taste and lifestyle. Do you want plain and simple or you want elaborate and richly adorned? Be sure that the furniture color will match your house. Aside from size, style, and material, you need to consider quality too. Quality is very important to ensure the sturdiness of the furniture. No homeowners want to purchase furniture every year. As much as possible they want to buy quality furniture that would last for many years. It is a waste of time and money if this happens because finding a replacement is not easy too. Lastly, check your budget so you can narrow down your choices. Quality furniture doesn’t have to be expensive so if you have a very limited budget, do not be sad because you can also find good quality furniture at reasonable prices. If you have limited time to look around, you can check the internet and look for possible sales, clearance sales or discounts from the comfort of your home. You will be amazed that even Tom Faulkner has their own clearance sale. They sell clearance pieces or ex-displays that you might be interested. Some online shops offer free shipping. Choosing furniture may not be easy but if you consider these factors, task would be easy and you may enjoy the process. Happy Shopping!